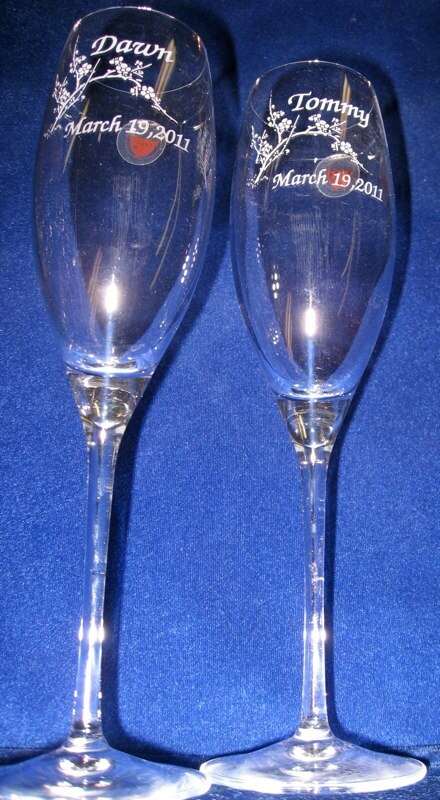 Our engraved champagne flutes remain as beautiful on your 50th wedding anniversary as they are on your wedding day. With our glasses you can mix and match the designs. Most of the glasses on at the top this page are Lead Crystal. If you scroll down you will see a photo of our Crystal Champagne glasses and below that our glass ones. It shows a height comparison. Further down you can see just a small sample of our designs. 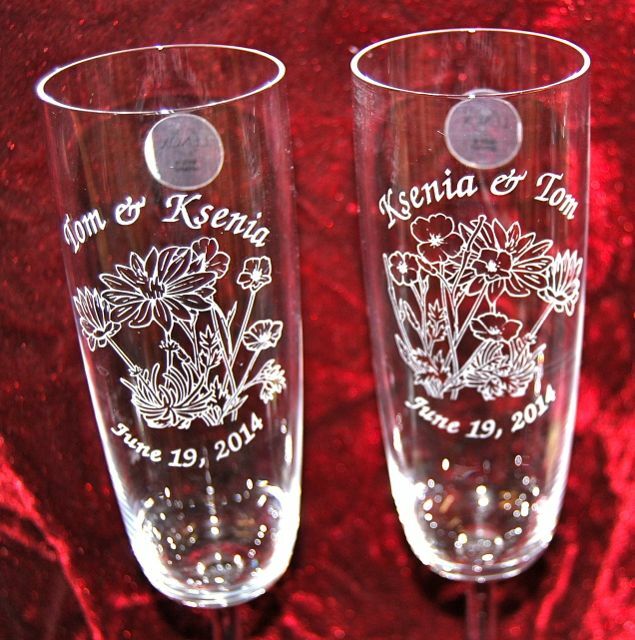 We can engrave thousands of designs, not just the ones that you see on this page. 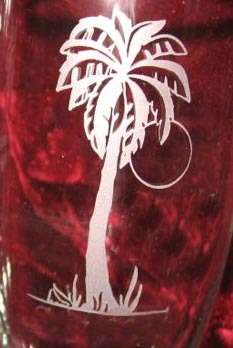 Palmtree Champagne Flutes - Our Wedding Champagne glasses are engraved with a Palmtree. They are $16.95 each engraved with 6 letter name. Additional engraving is .50 per letter or number. 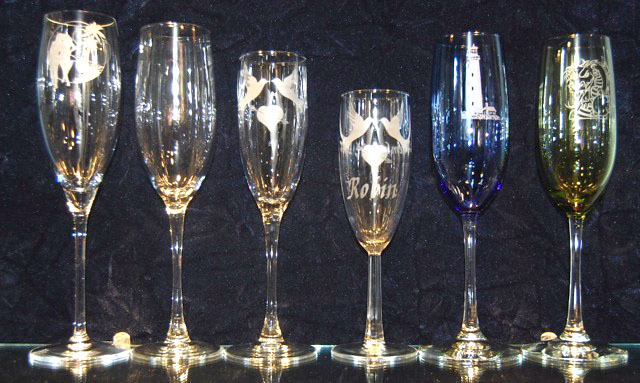 Our Lenox Champagne Flutes arrive in our store as a blank canvas, We engrave them with designs of your choosing. 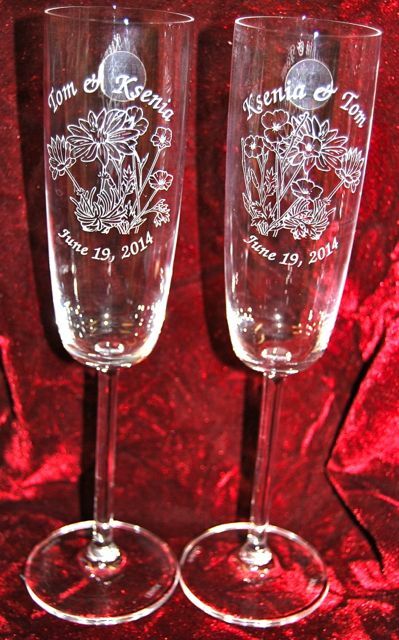 This set was engraved with two different flowers as the couple originally came form 2 different states. These flowers are from the states that they came from. 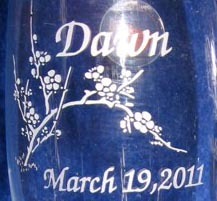 I also engrave them with both names and the date of the wedding. I also reversed the names and the flowers. His name is over the flowers from his state and her name is over her states flower. For our local customers we are also happy to engrave on your glasses. If you scroll down you can see the different heights of our champagne glasses. 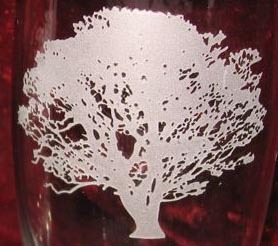 We can engrave any of our designs, or your design, on these champagne glasses. We include a six letter name, additional engraving is .50 per letter or number. So the date 2-14-12 = $3 .50 per glass. 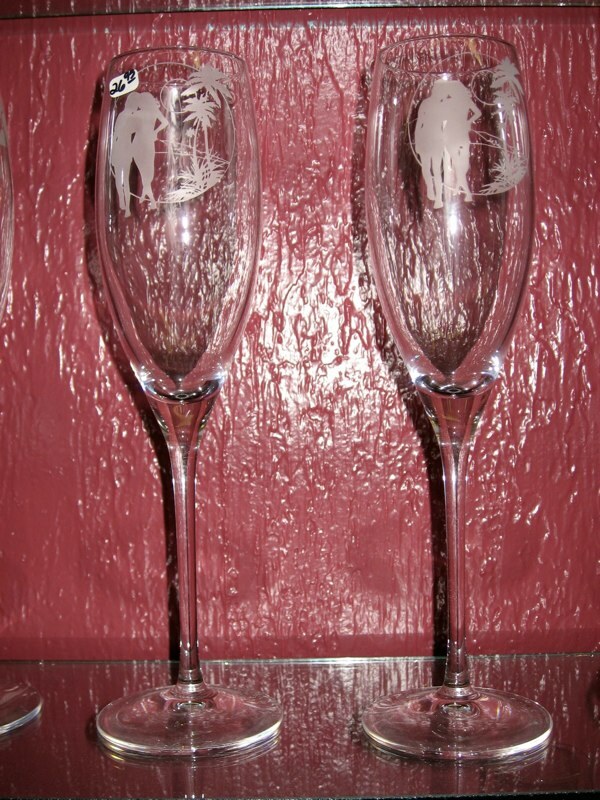 Connoisseur 8 oz Flute Champagne Flute engraved with Beach Wedding Couple and a name are only $21.95 each. 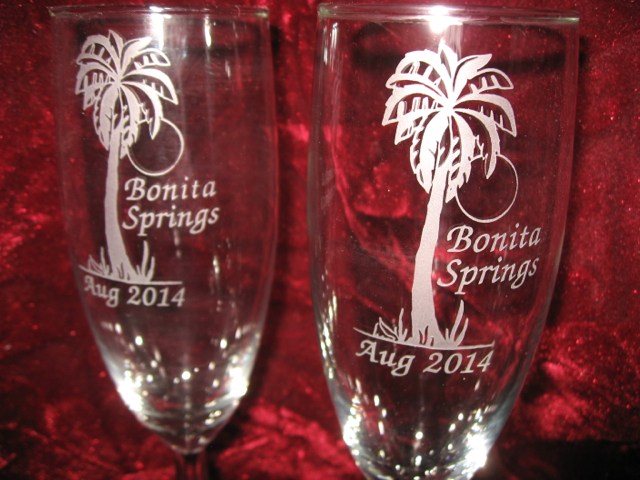 We include a six letter name, additional engraving is .50 per letter or number. 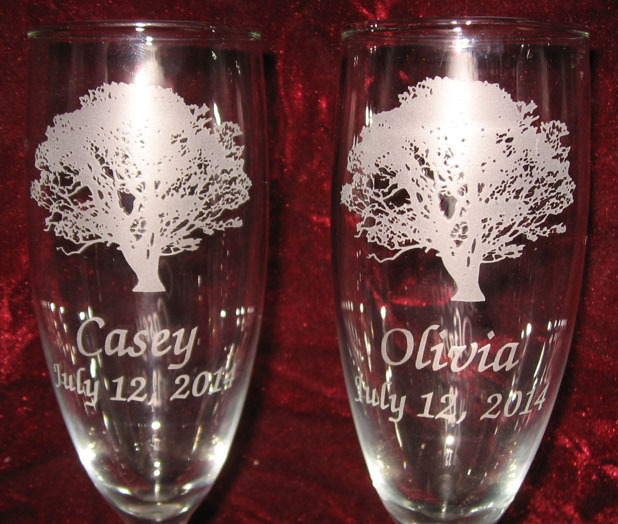 If you are looking for Personalized Wedding Champagne glasses engraved the Way you want, email us, we custom engrave custom Champagne Toasting glasses for Brides looking for something different every day. 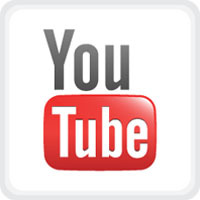 Every item on each or our web pages can be custom engraved. Crystal Selection $32.95 Item #C2 not available, this glass is from our Crystal Champagne glasses above. and green flute $16.95 flute champagne glasses Item #G5. These prices are engraved with the any of our Designs shown here or on Our other pages as well as a 6 letter name on each. Additional engraving is .50 per letter or number. 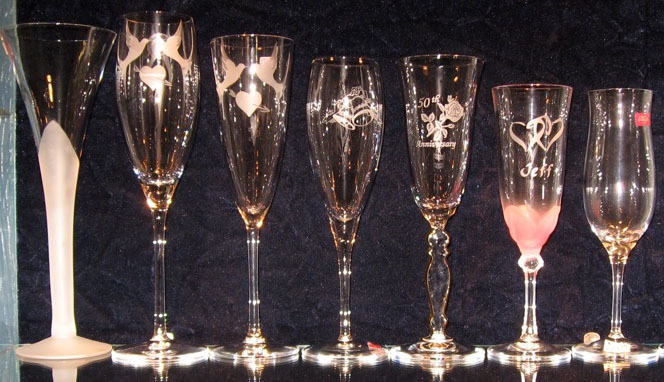 This is just a small selection of the designs that we can engraving on our wedding champagne glasses.